Many of my readers know that I am a fan of kimchi and even make my own kimchi at home. Making kimchi may involve a lot of work but worth the trouble taken when you you have a jar of ready homemade kimchi in the fridge. At any one time you feel like cooking kimchi stew , it is there for you. Save the dollar is one thing but it is also freaking healthy because you know what you put inside your enzyme packed kimchi. 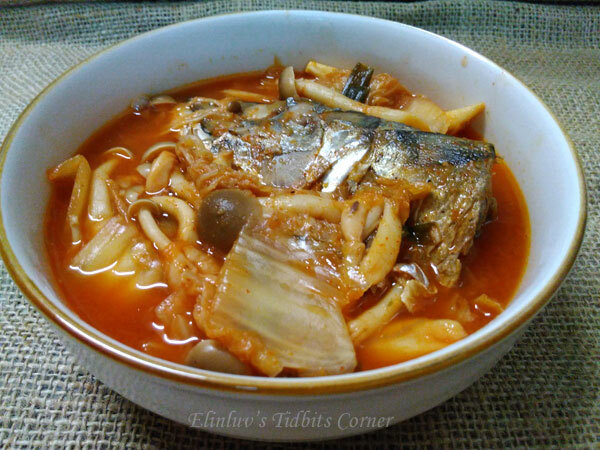 Needless to say , when I have a piece of leftover grilled saba mackeral in the fridge, kimchi stew came to mind and with the mackeral , I added some crab meat mushrooms to the stew and GOSH it was lip-smacking good ! Believe me, it was so good that even WB asked for a bowl without the fish of course...he doesnt eat fish for your information..scared of bones....mmmmm he does not know what he misses. Anyway, I always believe less man more share...LOL so wicked of me to say it...* shrug the shoulder * If anyone of you would like to make your own kimchi..here is the recipe link for homemade kimchi. Combine (A) in a claypot and simmer under medium heat. When it comes to a rolling boil, add in grilled mackeral fish and crab meat mushrooms. 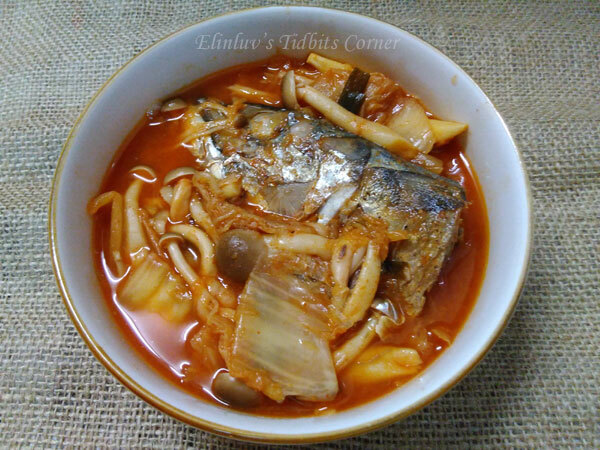 Cook till the mushrooms has soften and the sweetness of the grilled fish has been boiled into the stew. Add in a pinch of salt for taste . Off heat and garnish with spring onions. Serve hot with noodles or rice.